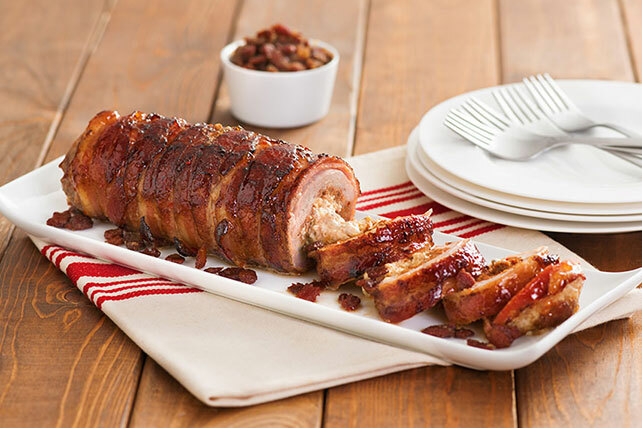 Impress the whole table with our Bacon-Wrapped Stuffed Pork Loin. Don't worry, Bacon-Wrapped Stuffed Pork Loin isn't as difficult to prepare as it appears. Create a glaze: Combine peach preserves with 1 or more finely diced chipotles and 1 large crushed clove of garlic. Set aside. On cutting board, butterfly pork tenderloin, and pound with meat tenderizer to even thickness. Spread chorizo over tenderloin. Spread PHILADELPHIA Cream Cheese Spread down center and sprinkle shredded cheese on top. Roll-up tenderloin. Using slices of bacon, wrap tenderloin until covered. Secure with toothpicks, if needed. Place bacon-wrapped loin in cast iron, or heavy bottom fry pan. Cook until bacon is browned on all sides. Remove from fry pan and place in foil-lined baking dish. Bake for 25 minutes or until tenderloin reaches 160-165ºF, coating with glaze during the last 5-10 minutes of baking. Remove from oven and let rest for 5-10 minutes before slicing. Create caramelized bacon (yum! ): Dice remainder of bacon into small to medium pieces. Using the same fry pan, brown until crispy. Drain off excess bacon drippings, leaving behind 1 to 2 tablespoons. In pan, add a few grinds of fresh pepper and 1/3 or more cups of brown sugar. Stir bacon to coat with sugar mixture. Cook over low heat until bubbly, be careful not to burn! Remove from pan. Now that your tenderloin is glazed, cooked and cooled, and your caramelized bacon is complete, it is time to serve. Slice tenderloin, and place on a beautiful serving platter. This dish can be easily doubled or tripled making it a great dish to serve buffet style at your next party! Fill half your plate with fruit and/or vegetables that are steamed, sautéed, roasted or raw.